Pega® Platform now provides a way to accelerate running large-scale batch data flows and simulations over an entire customer base, which can consist of tens of millions of customers. Strategy designers can create globally optimized strategies from existing strategies to decrease the run time, memory consumption, and computation time of strategy properties. Improvements to the Strategy rule performance are the result of changes to the code generation model and optimization of a number of Strategy components. Strategy designers can optimize any existing strategy and check its performance against the non-optimized instance with batch data flows. However, when the strategy contains many components that cannot be optimized, performance improvements might be insignificant. In such situations, strategy designers should rethink the decision logic behind the existing strategy and try to redesign the strategy before they create a globally optimized instance. Create a globally optimized strategy. For more information, see Creating a globally optimized strategy. 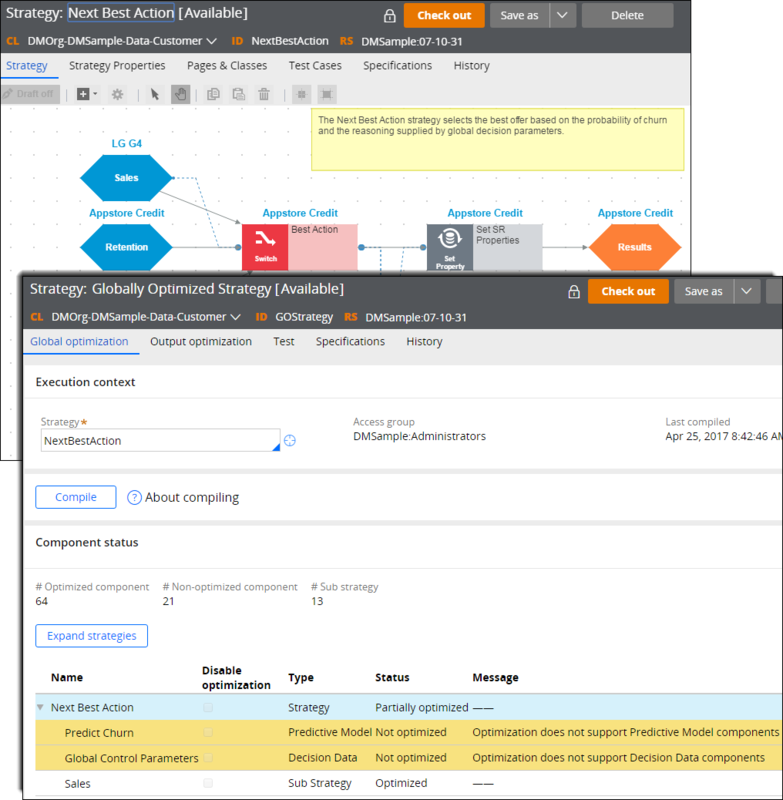 Create a batch data flow and run it with the non-optimized and optimized instance of your strategy. For more information, see Creating a batch run for data flows. 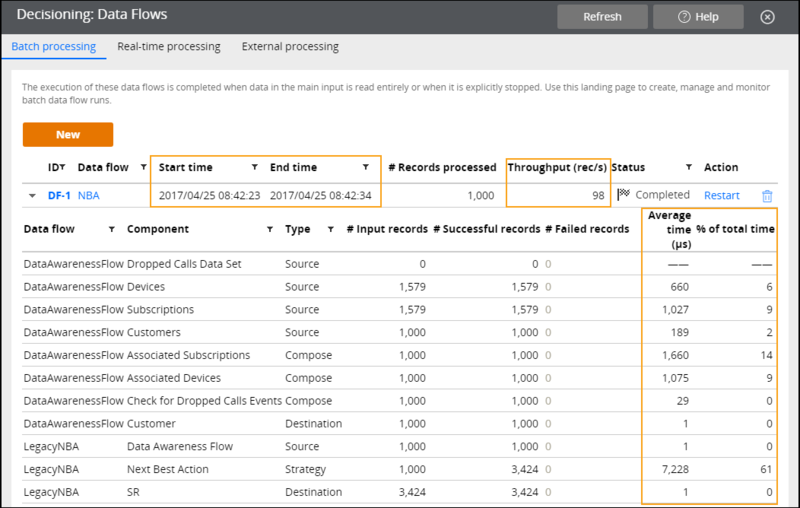 Check the details of each run in the Data Flows landing page. For more information, see Data Flows landing page. 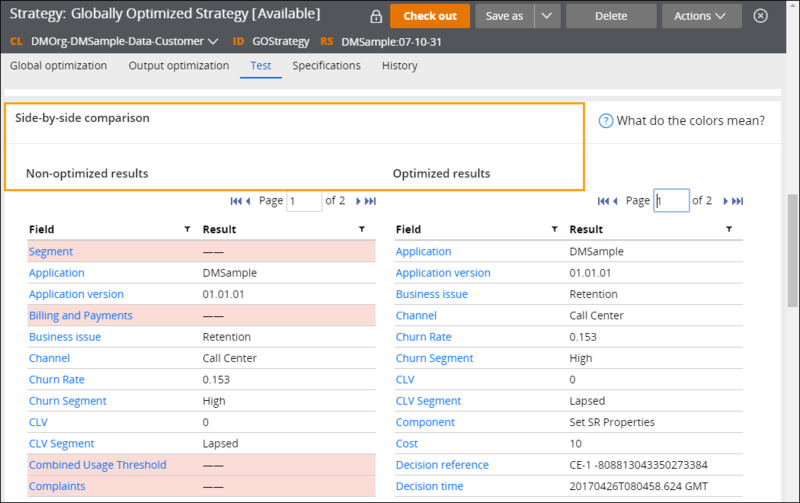 You can test globally optimized strategies and check how they improve strategy performance by using strategies that are in the DMSample application. For example, you can create a globally optimized strategy from the Next Best Action strategy. You can compare optimized and non-optimized versions of strategy results on the Test tab. Finally, you can run a batch data flow with the non-optimized Next Best Action strategy and its optimized instance to see if data processing improves for the optimized strategy. When both runs are completed, you can compare their processing time, throughput, and average time per component to identify performance improvements.